The Radial Zoom Blur effect creates blurs around a centre point, simulating the look of a zooming or rotating camera. Select Layer > Apply Effect on Bitmap Layer > Radial Zoom Blur. Lets you set the x and y coordinates individually for the centre. Amount of blur applied to the layer. 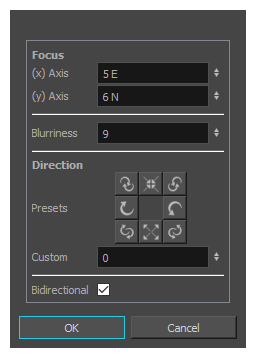 Lets you select preset blur types. A set of preset radial, zoom, and spiral blurs are available to get you started. You can then adjust the type to customize the blur. Lets you select a custom blur direction. Create your own blur by entering a value for the direction of the blur lines. Applies the blur on both sides of the pixel.